In spite of last week's snow, I declare that spring is finally here! 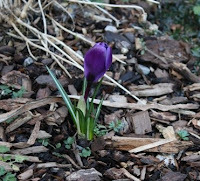 Yesterday I saw my first crocuses in bloom. This is exciting for three reasons: one, because crocuses are always the first spring bulbs in bloom here (which takes me back to my college days when they would peek out from a few inches of residual Spokane snow); two, because that means that my bulb planting was a success (this is my first time planting bulbs); and three, because I got to see the blooms before Jasper tramples them, as she will surely do if we don't make a fence soon. I put up a decorative border when I planted the bulbs, but it does nothing against the bounding power of Miss Springer Spaniel. I have decided to make a bamboo fence to protect them from Jasper's fetching zone.